Every now and then, I need to reconnect with my inner yogi and seek out the renewed energy I so often experience after a yoga class. With the hustle and bustle of the winter season long behind us, finding a moment of zen while bathing in the sun's warm light has never been more appealing. Throw in some new yoga gear and you can officially colour me inspired. At the top of my list of must-have yoga accessories is a fresh new mat. New for the season is a collection of yoga mat designs in various colours, prints and thicknesses from a fresh new line by renowned wellness brand Gaiam. For review, I opted to try out the 5mm Reflection Reversible Print Premium Yoga Mat because I was instantly drawn to the lotus flower print. It also pairs quite nicely with my Gaiam Thirsty Yoga Mat Towel. The Premium Reversible Mat features a "sticky" non-slip surface and is made without the six most harmful phthalates. It is listed at $39.99 but if you prefer the 3mm Classic, it costs only $21.99. Next up is the super stylish Metro Gym Bag. 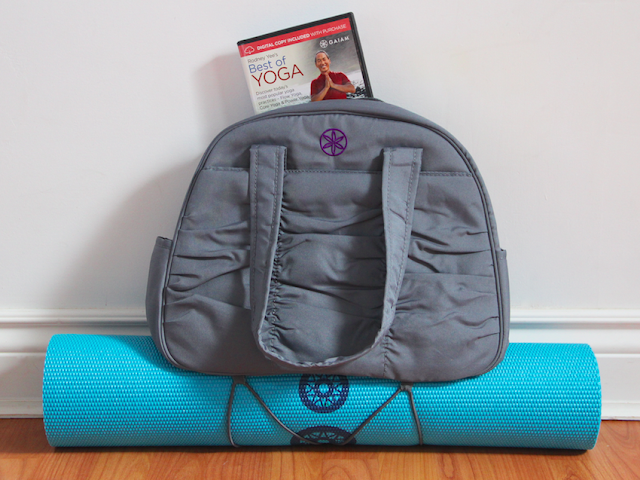 It has pretty much everything you need in a gym bag, only without all the bulk: large pockets with magnetic snaps, sides pockets to hold water bottles or other essentials, a zippered pocket on the inside to secure valuables, a key ring holder, and a cinch cord on the bottom for your yoga mat. The only thing it doesn't come with is the fabulously fit body (or yoga mat) seen below. The Metro Gym Bag is not just my yoga bag. I bring it with me to my boot camp workouts. It is extremely lightweight and I absolutely adore the purple lining on the inside. Plus, it is machine washable and did I mention stylish? It is currently available on gaiam.ca for $39.99 and is totally worth the investment. And as an added bonus, a digital copy is included with purchase so I can take Rodney Yee pretty much everywhere I go. The DVD is currently listed at $14.99. So... feeling inspired to get your yoga on? Head on over to gaiam.ca to find your own moment of zen. Namasté. Way to go with your mastering of the headstand! :) I loooove that metro gym bag too! I have always wanted t try yoga but have yet to try, this makes it look and sound even more interesting,thanks for the post! You're headstand is outstanding! And I've been looking for yoga dvds - will check these out! Oh, how I wish I could do yoga, but with my arthritis I just can't! My sister is really into yoga, I'm more into running, BUT I would love to try yoga. I know it's so good for your body, mind and soul. I've always wanted to get into Yoga, tried it for a few classes, but, didn't like how unstretchy I was :) but, I was always willing to give it another go! Thanks! Rodney Yee is such a knowledgeable teacher. I am going to look for this new DVD. If it is machine washable, then half the problem is solved. I just signed up for classes ,they start in a few weeks. I hope I get as much peace as you! 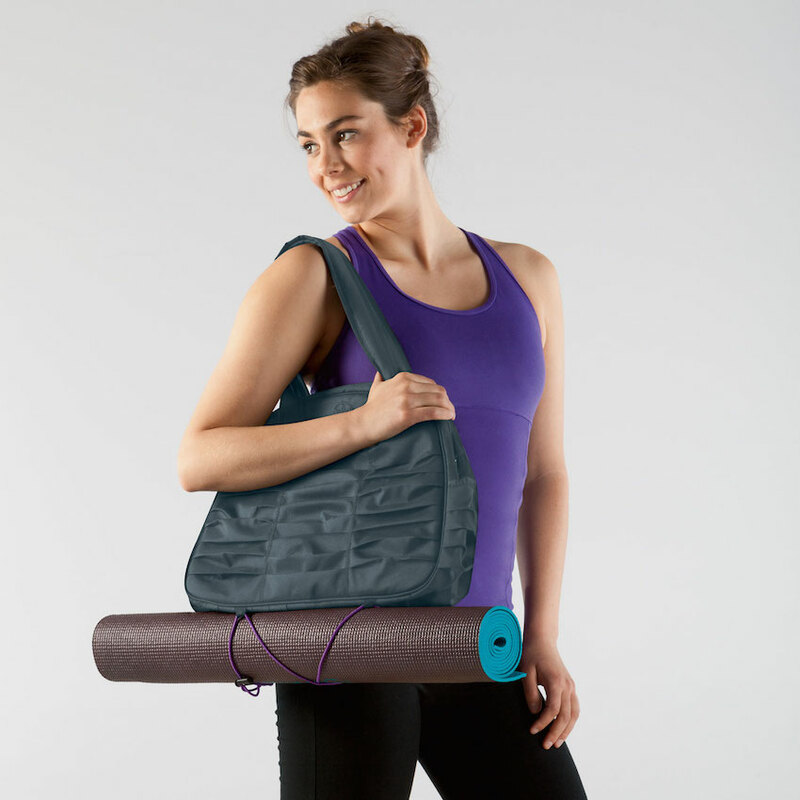 I'm coveting all of these Gaiam products!! That was an awesome headstand you did!! I love Gaiam products and just ordered the chair with the ball. I would love to find a good yoga begiers cd. Not the crazy stuff you do. WOW impressave.